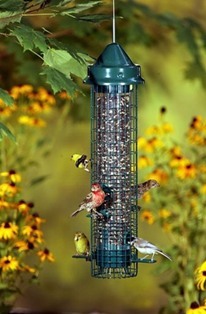 Yes, This is the feeder we recommend to our customers who ask for the "World's Best Squirrel Proof Bird Feeder." The Brome Care Squirrel Buster Classic returns! If you're looking for a feeder that does NOT restrict your bird choices, BUT does keep both red and gray squirrel from eating your bird seed, look no further! Completely patented design, it is the most duplicated feeder on the market, but this is the original, weighted cage tube feeder. It's proven design can NOT be duplicated. But, that doesn't mean every big box store will stop trying. Stop wasting any more money on other so-called "squirrel proof bird feeders." Your search is over! Listen to our exclusive, live radio interview with the inventor and owner of the Squirrel Buster line of squirrel proof bird feeder products!! The patented Squirrel Buster technology is truly red and grey squirrel proof. Thousands of delighted bird lovers have confirmed it. How it works: Made of steel, openings in the wire shroud align with seed ports and provide birds access to the seed. When a squirrel climbs onto the feeder, its weight automatically forces the shroud down, closing access to the seed ports. All squirrels and many large birds are foiled but not harmed in any way. The Classic is permanently set to close at 4 ounces, the weight of a small red squirrel. Dismantles, without tools, for easy cleaning. 1.4 quart capacity.